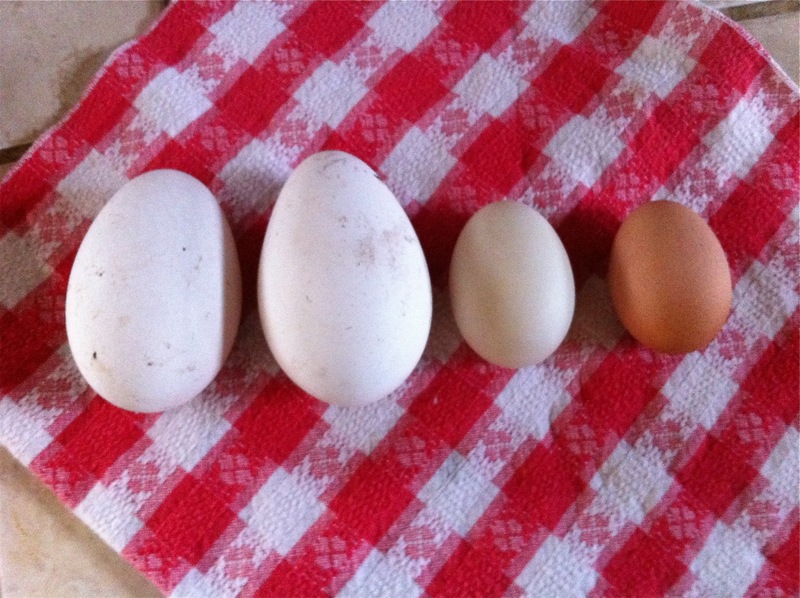 I've placed a duck egg and an extra-large chicken egg next to the goose eggs for comparison. The geese are much later laying this season than last - last season, the first egg was laid on the Solstice! I'm wondering if the extra warm winter we're having (compared to the cold one last year) has been affecting their inclinations. Will have to do some research. Anyhow... woo-hoo! Last Saturday was the first day I felt up to doing chores around the property. 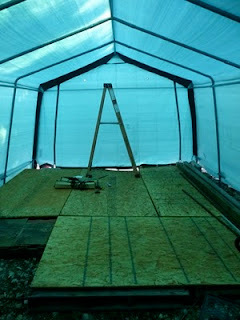 The bones of the new 12'x20' tarp shed were up and ready, so decided to finish the job. 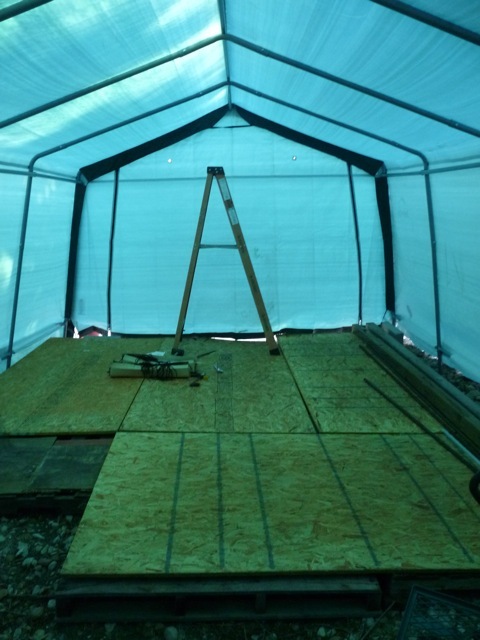 Spouse helped me move the 4'x8' plywood sheets from the porch to layer on top of the pallet-based floor ("oooh, mice are gonna love this!" 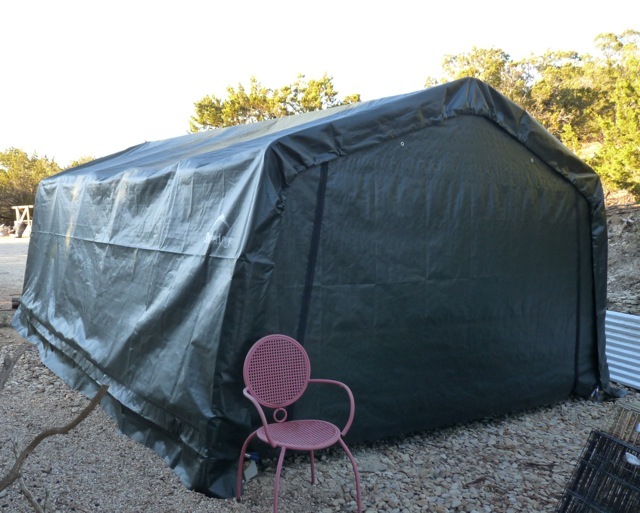 he crowed), and then throw the main tarp over the top of the shed (too heavy/cumbersome to do on my own). As I joked to friends, it seemed the writer of the instruction manual for the shed got distracted on the last few pages, as there were quite a few important steps skipped on how to secure the tarp to the frame, but managed to get everything squared away. The shed was finally completed. That's a six-foot ladder in the back. Angels sang hosannas, light poured from the sky... I can move all the tools, lumber, garden supplies, fencing, carts & dollies, you-name-it-we-haz-it from the porch and around the property into ONE ORGANIZED LOCATION. All our white-trashy goodness, all tucked away... listen... the angels are singing again! 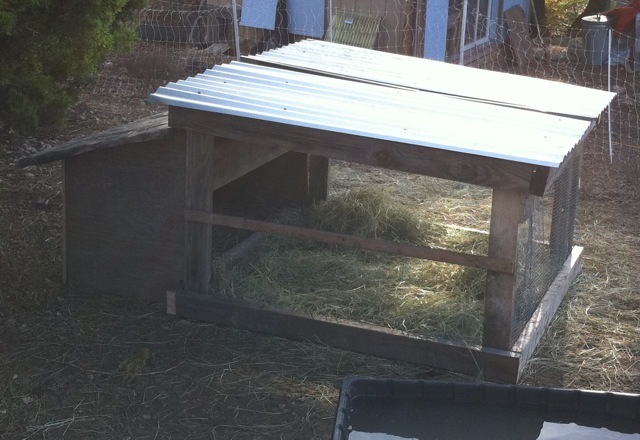 ♪AAAAAAAAHHHHH!♫ And even more important: it's all tucked away from the ever-rampaging destructo-geese! boot is evil. Consensus: yes, evil. With the remaining credit from the returned trees, brought home the fixings for growing potatoes in buckets**, and making a lighter soil mix*** to fill the new raised, terraced 4'x4' veggie beds. Also brought home bags of pine-bark nuggets to fill the muddy swamp holes the recent rainstorms have created, 50 lb bags of goose/duck chow and chicken scratch grains, plus two bales of hay for the duck and goose egg-laying areas. Loading up the car, then putting it all away, I probably worked harder AFTER work than during my time at the nursery. 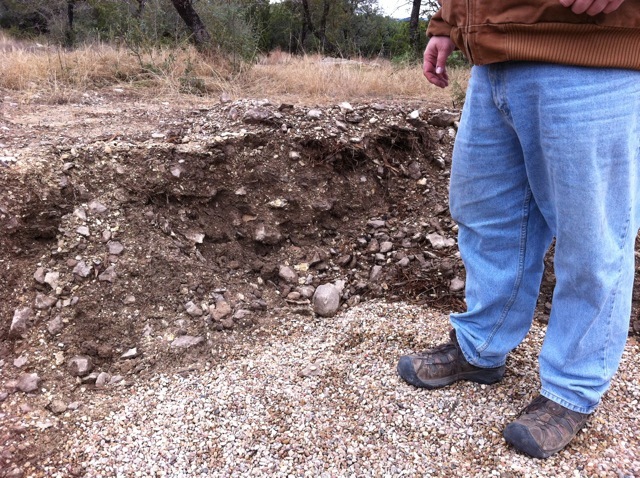 *We'll do more test-digs further down the property, but if we do find decent soil down there, it'll mean clearing out brush and trees, as well as trenching and laying water pipes. Maybe next year. **Growing medium for bucket potatoes: straw and compost. See this Google Search for plenty of info on how to grow potatoes in a five-gallon bucket. I'll post more as the project begins. ***Modifying a recipe suggested in Square Foot Gardening by Mel Bartholomew. [I refuse to link directly to his web site because it's completely Flash-based. I'm a geek, I can be unreasonable about bad implementations of tech, lack of accessibility, and those sorts of things.] Oh, the soil mix? A combination of compost, peat moss, vermiculite, and some topsoil. I'm making the soil mixture a bit "heavier" than the original recipe so it won't dry out as quickly in the Texas heat, but still light enough that the veggie roots can grow quickly and deeply. Will also post about that project as it comes along. The backhoe came in late, but can't complain too much as we get to use it for the entire weekend (plus part of Monday) for the price of one day's rental. So Spouse and I did something rare: after animal chores, we went back to bed! Ooooh, so nice... sssnzzzzzzz. Once the backhoe finally arrived, it was time to rub the sleep out of our eyes and get to work. First priority: re-dig the pond for Gooselandia. We were originally going to use a stock tank set in the ground. We had the hole dug, and the tank situated and leveled. 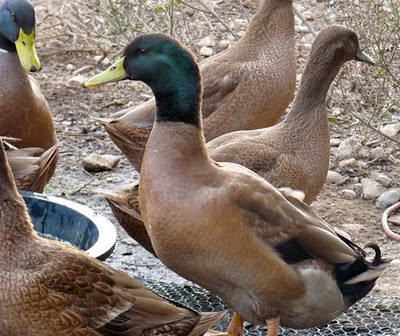 The more we thought about it, however, the more it seemed like it would be a royal pain to create the appropriate berms and ways to get in and out of the stock tank: not just for the geese and ducks, but for any small fry they might hatch. Plus with the ducks, the tank was now going to be too small for everyone to swim in peace. 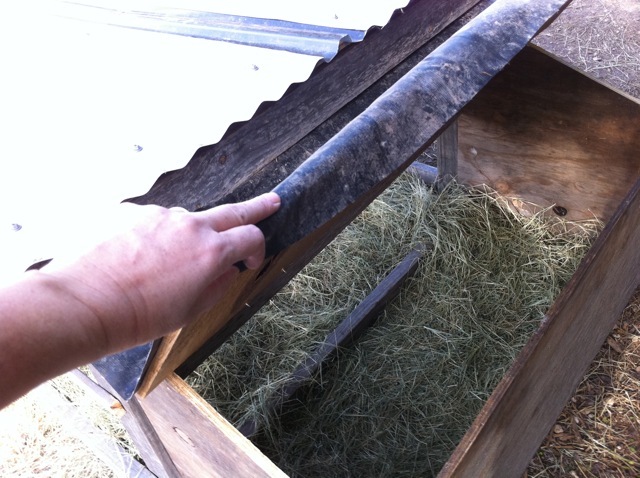 Round two: take out the stock tank, then dig out and slope the sides. The tank was partially full of rainwater, and had a nice thick layer of algae and sludge at the bottom. We'd also a large branch half in/out of the tank before the photo, so the frogs and snakes could get out as needed. No frogs or snakes this time... anyhow, bailed out the water, shoveled out the sludge, then pulled out the tank. After a break and a quick side project of moving a big pile of soil up the hill where our raised veggie beds will be (another post), Spouse started sloping out the sides of the pond area. The old hole was approximate 10'x10'x2'. The new hole, with sloping sides, measures about 20'x16'x2'. Pond liner - the good stuff, heavy rubber, fish safe and all that - ain't cheap, but with my Awesome Employee Discount™ at the feed store, we can probably line this hole for about $200. We'll also need to shell out for a heavy duty pond pump and filter, due to all the poo. 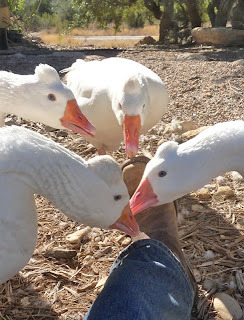 The ducks out-poo the geese, and the geese are no slouches by any means. Together, they create MEGA-POO, killer of puny pond pumps and filters alike. Our poor 3'x5' side pond! If we don't clean the filters every other day, the water quickly becomes a mess. 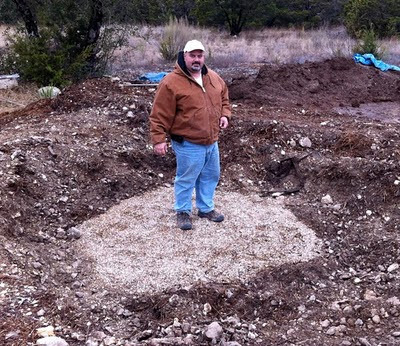 So, slowly but surely, progress on the Gooselandia pond proceeds apace. 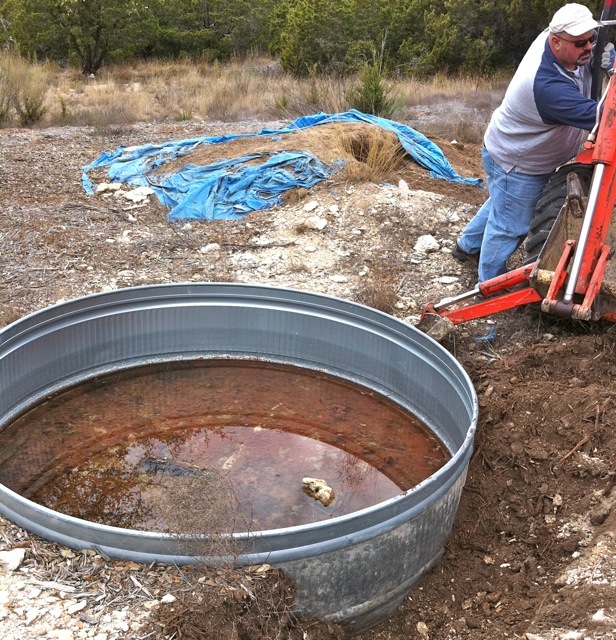 Once lined, pumps installed, and filled with water, we can move the duck and goose shelters to the new pond area. What will be next: trenching so that electric and water lines can be routed to the area. We can currently stretch two connected outdoor extension cords to the area, and ditto for water hoses, but this is not a viable long-term solution. Yay, we get to rent more heavy machinery!! !